I honestly think this is perfect! Maybe I'm easy to please, but I'd like to keep it as it is. Consider this complete and thank you so much! So you’ve booked a gig as a DJ. Here you are getting ready for the night, backing up your music and preparing your playlist when suddenly you’re asked for a DJ bio. You’re stunned. How can you write a biography that fasts? Many DJs dread the idea of having to write a bio because they are mostly here for the music. There are a lot of DJs who don’t even like writing or talking about themselves. Unfortunately, as much as you hate to write, you will still need to deliver a good biography because it’s still a good marketing tool to use. The idea of writing your DJ biography can be quite scary even if you’re asked to write a short one. What exactly can you write in just four sentences when you have a lot to say about your career as a DJ? You might think this is impossible but this is not so. There are ways for you to get your biography to impress your readers even if it’s just a short one. How? Read on to find out more. What makes you different? You’re not the only DJ in town with skills to think about what makes you unique. Think about your past experiences as a DJ and from there decide which best represents you and your skills. If you have time, check out other DJ bios just to get an idea of what to include in your own biography. Keep it short, simple, and sweet. The worst thing you can do when writing your biography is to go on and on and on. 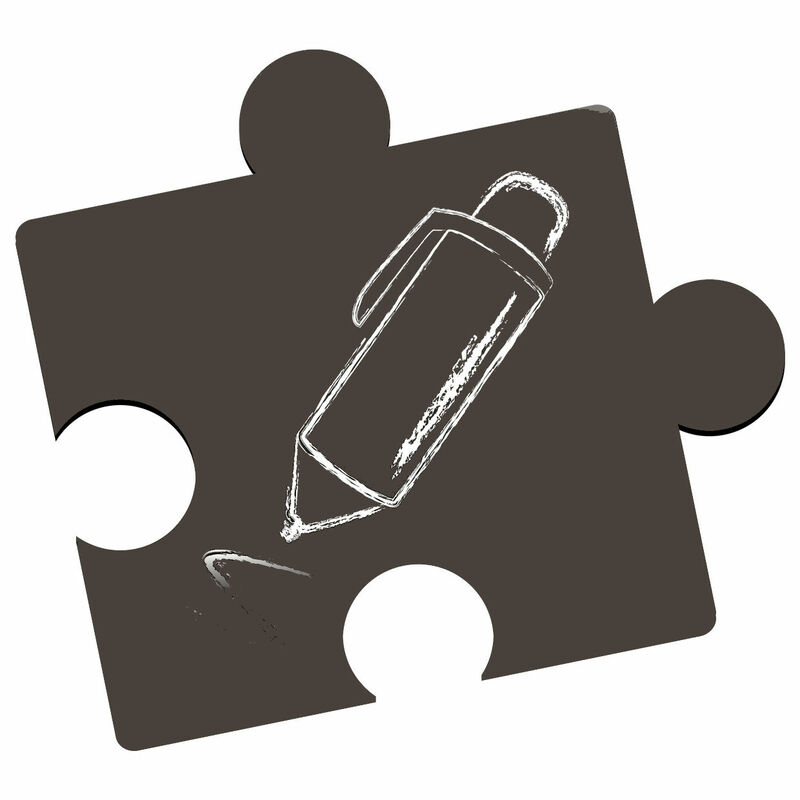 Keep your bio short and simple and you’ll get a better reception with your readers. Of course, it wouldn’t be a bad idea to write a longer version of your bio in case there are producers who would want to know more about your work. Avoid clichés. Some use clichés just to sound interesting in their biography. Just so you know producers, as well as anyone who has made a career out of being DJ, knows that clichés don’t really fly when it comes to bios so skip it. If you’re wondering what to write, think about a specific demographic you want to target with your bio or the kind of music you are most familiar with. Get help. Don’t worry about not being able to write your own biography. There are plenty of writing services out there that can get this done for you like us. Obviously, the responsibilities of DJ are nothing but to compel the public to listen to him and keeping the public stay bound is definitely a big art. The readers of DJ biography also expect the same from DJ biography and judge very easily, how effectively this DJ can inspire the public. That’s why a DJ biography should be shining so much that it could attract the readers in a single glance. Following are some prompts to make your DJ biography shinning and inimitable in comparison to other biographies. The first thing that you should mention just after your name in your biography is the count of your followers at social networking sites. It is obvious that if you are leading a DJ life, you have Facebook and Twitter followers. The number of followers simply means people like to listen to you. If you have invented some good tone of music or even have remixed some existing tone and uploaded to your social media accounts. You should mention the maximum number of likes for your exclusive theme. YouTube rating is very important for a DJ. You must mention the count of likes for your YouTube channel. After all these, you should mention the track of your professional career as DJ along with achievements and awards. Don’t forget to include a stunning and beautiful photo of yourself in your biography. Our DJ biography writers know the art of portraying the DJ life on paper very well. They know how to inspire the reader by means of presenting an exciting and powerful DJ bio in front of them. 24/7 online availability of our DJ writers with the facility of direct communication, make our writing service an exclusive one among all other writing services. 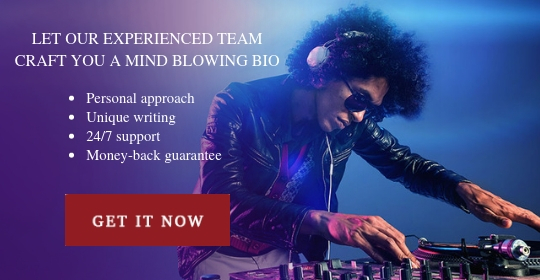 Our DJ writers make your biography customized exactly as per your requirements and share the winning DJ formats with you to make you more precise about the selection of bio format. 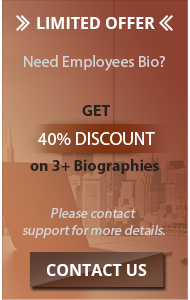 We are also best at the price of writing DJ biography thanks to our discount rates. 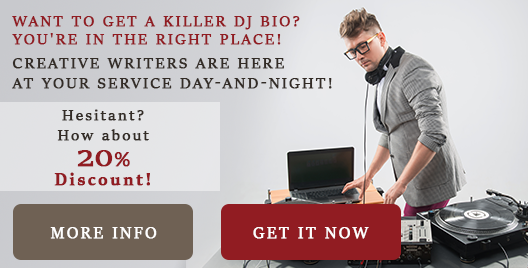 Choose our writing service today and we’ll craft the best DJ bio for you! Contact our support team 24/7!